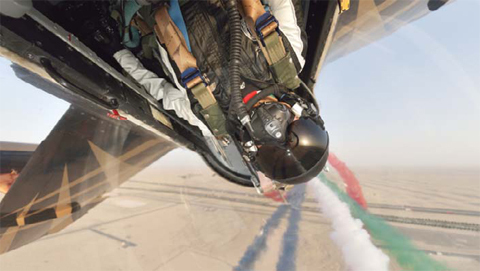 KUWAIT: Visitors to the 11th edition of Al Ain Air Championship will witness heart-stopping stunts from ten civilian and military flying teams alongside live entertainment, music and fun for all the family over the three-day event from 17th to 19th of December. The UAE’s national aerobatic team, Al Fursan, will showcase high-octane stunts as part of a series of spectacular and daring performances at The Al Ain Air Championships, which will feature a brand new competition format that will allow visitors to be part of the action. A new mobile app will give fans the opportunity to vote for their favourite team, and ultimately influence the competition. “With our action-packed schedule of funfilled family activities, ranging from dramatic aerobatic displays and simulator experiences to interactive games and car-drifting spectacles, the Al Ain Air Championship will be a must-attend event, “said Sultan Al Dhaheri, Acting Executive Director Tourism at Abu Dhabi Tourism & Culture Authority (TCA Abu Dhabi). “We are not just focusing on the daytime activities; we’re extending the experience into the evening with live music and a daily hot air balloon display, set to an impressive sound and light show for the whole family to enjoy.” Teams will compete to be crowned the Grand Champion of Al Ain Air Championship 2015, as awarded by the judges and audience, via the interactive app, based on their performances in a number of areas, being scored on their ability to illustrate grace, power and pride for their respective nations. Lieutenant Colonel Nasser Al Obaidli, Fursan Al Emarat Team leader, said: “The Fursan Al Emarat team represents the entire nation of the UAE. As part of the Air Force, our mission is to do the nation proud while engaging and exciting people with our stunts. We are thrilled to be part of the Al Ain Air Championship and are excited to see the other acts from around the world. It is an event not to be missed for aviation enthusiasts and families alike.” Other civilian and military teams set to perform include the Saudi Hawks, Breitling Wing walkers (UK), Red Bull Firestars (China), Richard Goodwin Air shows (UK), Misty Blues Skydiving (USA), Belgian Broncos (Belgium) and Glider FX Aerobatics (UK). Worldrenowned Spanish pilot Javier Tejeiro Lopez (Malaguita) will also be making an appearance, taking the sport of para-motoring to the extreme, in a partnership with the Emirates Eagles Para-motor Team. While the skies will be set for incredible performances, the nail-biting stunts and excitement will continue on-ground with Al Ain local and Red Bull Champions Drifting hero Ahmed Al Ameri showcasing his drifting skills. Adding to the thrill and excitement of the event, the motocross team ‘Freestyle Motor X’ will showcase its extreme motocross sports skills with state-of-the art bike suspensions, a huge vert and ramp take-offs. In addition, Mercedes-AMG will impress visitors with an extreme driving experience using three high-performance cars. Visitors will also witness the ultimate clash between the powerhouses of the sky and performance vehicles on the ground in the official Air Drag. The race will see a Mercedes AMG E63, with its 585-horse power twin-turbo V8 engine; go head-to-head against the brawn of Richard Goodwin’s Pitts S2S muscle plane in a two-part match race series. As the crowds get peckish, a gastronomic feast awaits the visitors to offer more than 20 gourmet dining options from a variety of restaurants to food trucks from the likes of Khameer & Dough, Limeline, Dessert Chill, Gold Box, Mandilicious, Kebabs & Bunz, Calle Tacos, and Urban Bites. The event will welcome ‘rhyme and rhythm’ as part of the evening activities with live music performances from New Orleans Jazz Band on 17 December, The Swing Pack on 18 December and Gari Deegan on 19 December, as well as a mix of tunes from the Red Bull DJ Trucks. Children will be as entertained as adults with family attractions ranging from arts and crafts, to soft play areas and games.